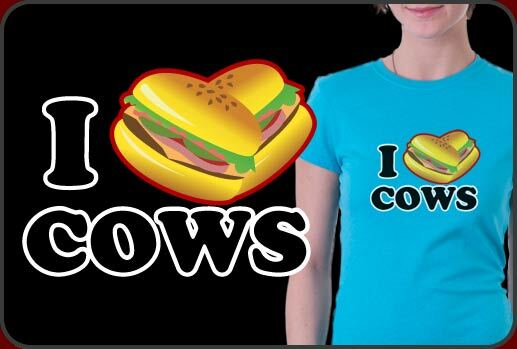 I Love Cows shirt tells PETA where they can stick it. This is a very funny t-shirt that puts PETA and veggie-zombies where to go. Don't tell us we can't enjoy our cow on a sesame seed bun and cheese! A very funny t-shirt that can be worn anywhere. Even to a PETA rally if you don't mind being splashed with buckets of blood and come on, what kind of meat-lover are you if you don't enjoy a good gore bath from time to time? This is a great looking shirt design that prints well on any of the over one hundred different shirt styles and colors we have available.